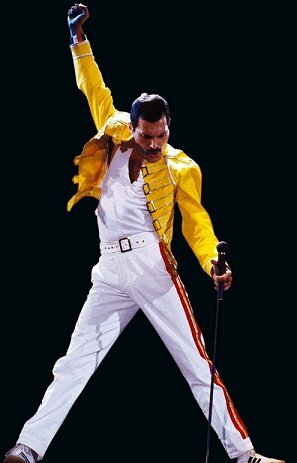 Best known as the lead vocalist and lyricist with rock band “Queen”,The late great British musician, singer and songwriter, Freddie Mercury ( Farrokh Bulsara) was born in Zanzibar on the 5th September 1946 and grew up there and in India until his mid-teens, which led to him being referred to as Britain’s first Asian rock star”. Mercury spent the bulk of his childhood in India & began taking piano lessons from the age of seven up to the age of nine. From the age of eight He went to St. Peter’s boarding school for boys in Panchgani near Bombay (now Mumbai), India one of his formative musical influences at the time was Bollywood singer Lata Mangeshkar.At the Age of 12, he formed a school band, The Hectics, & covered rock and roll artists such as Cliff Richard and Little Richard and began to call himself “Freddie”. He remained in India, living with his grandmother and aunt until he completed his education at St. Mary’s School, Bombay. At the age of 17, Mercury & his family fled from Zanzibar due to the 1964 Zanzibar Revolution and moved to Feltham, Middlesex, England where he enrolled at Isleworth Polytechnic (now West Thames College) in West London & studied art. He ultimately earned a Diploma in Art and Graphic Design at Ealing Art College, later using these skills to design the Queen crest. Mercury remained a British citizen for the rest of his life.Following graduation, Mercury joined a series of bands and sold second-hand clothes in the Kensington Market in London. While living in London, he also learned guitar. Much of the music he liked was guitar-oriented: his favourite artists at the time were The Who, The Beatles, Jimi Hendrix, David Bowie, & Led Zeppelin. In 1969 he joined the band Ibex, later renamed Wreckage then joined a second band called Sour Milk Sea, then In April 1970, Mercury joined guitarist Brian May and drummer Roger Taylor who had previously been in a band called Smile & Despite reservations, Mercury chose the name “Queen” for the new band. He also changed his surname, Bulsara, to Mercury and recruited bass guitar player John Deacon prior to recording their eponymous debut album. Queen’s earliest works were influenced by progressive rock, but the band gradually ventured into more conventional & radio-friendly works,incorporating more diverse & innovative styles in their music. They enjoyed considerable success in the UK with their debut and its follow-up, Queen II, but it was the release of Sheer Heart Attack (1974) & A Night at the Opera that gained the band international success, which featured “Bohemian Rhapsody”, which stayed at number one in the UK Singles Chart for nine weeks; it charted at number one in several other territories, and gave the band their first top ten hit on the US Billboard Hot 100. Their 1977 album, News of the World, contained two of rock’s most recognisable anthems, “We Will Rock You” and “We Are the Champions”. Mercury also played the piano in many of Queen’s most popular songs, including “Killer Queen”, “Bohemian Rhapsody”, “Good Old Fashioned Lover Boy”, “We Are the Champions”, “Somebody To Love” and “Don’t Stop Me Now”. He used concert grand pianos and, occasionally, other keyboard instruments such as the harpsichord. From 1980 onward, he also made frequent use of synthesisers in the studio and As a songwriter, he composed 10 of the 17 songs on Queen’s Greatest Hits album: “Bohemian Rhapsody”, “Seven Seas of Rhye”, “Killer Queen”, “Somebody to Love”, “Good Old-Fashioned Lover Boy”, “We Are the Champions”, “Bicycle Race”, “Don’t Stop Me Now”, “Crazy Little Thing Called Love” and “Play the Game”. He was also known for his flamboyant stage persona & displayed a highly theatrical style that often evoked a great deal of participation from the crowd. Over the course of his career, Mercury performed an estimated 700 concerts in countries around the world and by the early 1980s they were one of the biggest stadium rock bands in the world, A notable aspect of Queen concerts was the large scale involved. The band was the first ever to play in South American stadiums, breaking worldwide records for concert attendance in the Morumbi Stadium in São Paulo in 1981. In 1986, Queen also played behind the Iron Curtain when they performed to a crowd of 80,000 in Budapest, in what was one of the biggest rock concerts ever held in Eastern Europe. One of Mercury’s most notable performances with Queen took place at Live Aid in 1985, in front of an audience of 72,000 people, and has since been voted by a group of music executives as the greatest live performance in the history of rock music. Mercury’s final live performance with Queen took place on 9 August 1986 at Knebworth Park in England & drew an attendance estimated as high as 300,000. Mercury sadly passed away on 24th November 1991 of bronchopneumonia brought on by AIDS on 24 November 1991, only one day after publicly acknowledging he had the disease & Deacon retired in 1997. Since then, May and Taylor have infrequently performed together, including a collaboration with Paul Rodgers under the name Queen + Paul Rodgers which ended in May 2009. They also performed with Jessie J at the Olympic Closing Ceremony in 2012, together with a recording of Freddie Mercury in the background, which made Jessie look completely*CENSORED* and showed what a fantastic talent he had. During their career Queen released 18 number one albums, 18 number one singles, and 10 number one DVDs & are considered to be one of the world’s best-selling music artists. They received a Lifetime Achievement Award from the British Phonographic Industry in 1990, & were inducted into the Rock and Roll Hall of Fame in 2001 and in 2002, Mercury was placed at number 58 in the BBC’s poll of the 100 Greatest Britons, in 2006, Time Asia named him one of the most influential Asian heroes of the past 60 years, In 2008, Rolling Stone editors ranked him number 18 on their list of the 100 greatest singers of all time. In 2009, a Classic Rock poll saw him voted the greatest rock singer of all time & Allmusic characterised Mercury as “one of rock’s greatest all-time entertainers”, possessing “one of the greatest voices in all of music” & he continues to be voted one of the greatest singers in the history of popular music.